It’s June, and here comes the sun, Canada! The arrival of hot, sunny summer weather isn’t the only thing we’re celebrating this month. We’re also hip-hip-hooraying about a few mini-milestones we’ve achieved. First, we have completed our FrontFundr small investor campaign, with an estimated final tally of $640,500, +28% vs. our goal - thanks to you! Second, while we’re inching closer to completion of our third destination, Ottawa, with speedy construction of The Museum of History and final assembly of The Chateau Laurier, we’ve also initiated design on our 4th destination – Niagara Falls. It’s going to be mini-majestic! Third, because we’re obsessed about creating a great experience for our guests, we’ve complied a list of guests reactions captured from our recent events and put them into two awesome videos. Finally, the month of June is one of our favourites, because Canada Day is less than a month away! We’ve got a fun way to celebrate what is coming up. Read on for more on these mini milestones. Our FrontFundr Campaign - The Proof Is In The Numbers! We did it! Well, actually, you did it! May 26th marked the close of our small investor campaign with FrontFundr, and what an adventure it has been. The final tally of our campaign is expected to be $640,500 of investment, with $599,500 completed and $41,000 in final payment as of today. 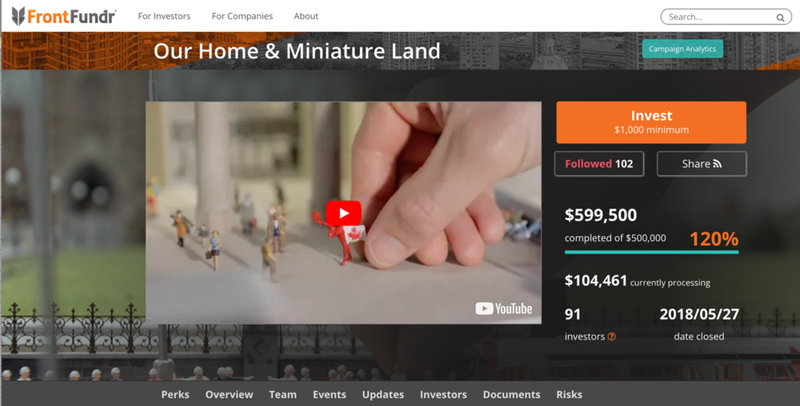 Over 60 new investors have joined our growing community of Canada Builders through FrontFundr. As Canadians, we've been taught the value of sharing, and we're thrilled to share this journey with you all. Thank you again for sharing our vision and becoming a part of this magical journey and great legacy to Canada. In the next few weeks we will be sending you each a package complete with your share certificate, details on your investment, next steps in the process and a few small Canadian goodies for you to enjoy. So, keep your eye out for any mini mail and stay tuned for more information. Our Newest Mini-Majestic Destination - Niagara Falls! With the finale of our Ottawa destination quickly approaching, the team is gearing up for our next mini Canada destination, Niagara Falls! Picture this: you, standing inside a 6 ft. tall, 16 ft. wide, roaring miniature Niagara Falls. A refreshing mist rolls up from the churning water and lands on your cheek as you look upon the lights and action of Niagara’s Skyline and Clifton Hill. It’s as close to being there as you’ll get without being there, and it’ll make you want to take the trip to experience the real version of one of Canada’s natural wonders. Planning is still in the early stages, but the team is already excited about how they can best evoke the sense of wonder you feel when visiting Niagara Falls. Nothing is too big that we can’t shrink to tiny-but-mighty size. Click through to see the sneak peek and stay tuned for updates. Smile! You're On Mini Camera. Our very own master modeller and skilled videographer, Spencer Barclay, has captured some reactions of our guests and their experience during one of our recent events. Take a look at this great footage to see what they're fussing about! Hey Canada! A sea of red and white is looming in the horizon, can you guess what it is? It’s Canada Day! For the month of June, our friendly Canadian moose, Maurice, has decided to take a celebration tour and explore the sights of our miniature Canada. In the lead-up to the big Canada Day event, Maurice will be posting pictures of his travels, and asking you to guess what new place he visited that day. Follow along to test your knowledge and Canada-landmark spotting skills.